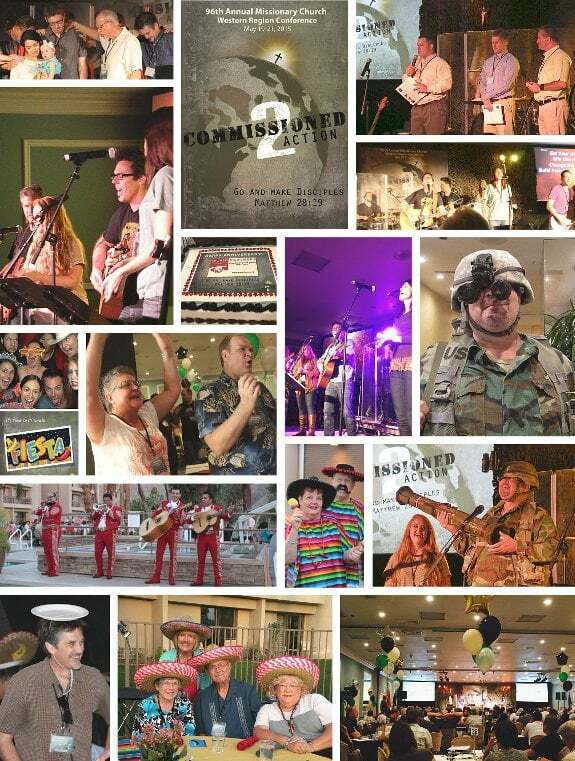 The 96th Annual Missionary Church Western Region Conference was held May 22-24, 2015 at the Indian Wells Resort in the Palm Springs area with our conference theme COMMISSIONED 2 ACTION…Go and Make Disciples! 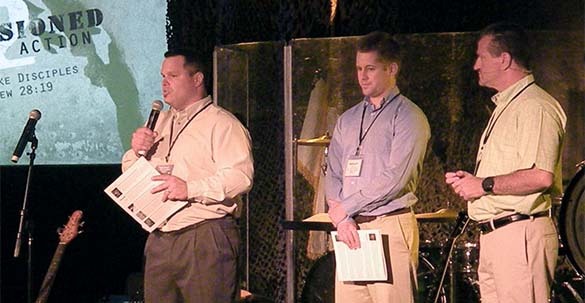 Opening and Introductions…Master of Ceremonies Pastor Chuckk Gerwig led the charge dressed in military fatigues & night vision glasses then Commissioned 2 Action the pastors and churches of the Western Region. Mike Livingston, Regional Director then opened the conference with prayer. Eddie Bateman: Operations Director Relational Discipleship Network & Pastor of Church Training & Development, Blake Whiteman: Adult Discipleship Ministries Team Leader, and Dr. Virgil Grant: Senior Pastor Eastside Baptist Church and Relational Discipleship Network Mentor Coach. Most in-depth spiritual growth doesn’t happen from across the pulpit but from across the table…Spiritually we move forward one spiritual conversation at a time…Do we care enough about folks to challenge them to take their next step? Disciple-making: God’s Part, Their Part, My Part. 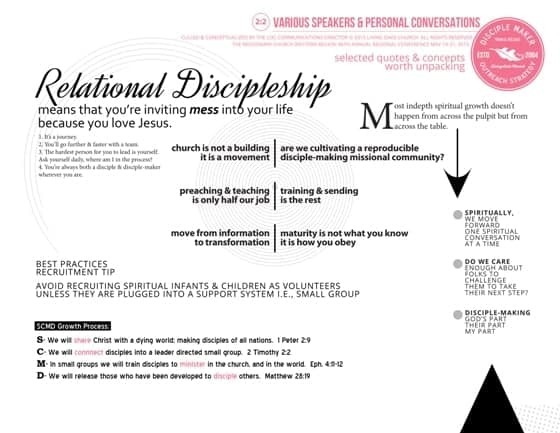 Church is not a building it is a movement | Are we cultivating a reproducible disciple-making missional community? Preaching & Teaching is only half our job | Training and sending is the rest. Move from informational to transformational | Maturity is not what you know it how you obey. For more inspirational insights from our speakers…Download Living Oaks C2A 2015 Quotes & Concepts PDF’s (2 pages right column Download). Audio Sessions…Be sure to listen to all 4 sessions (MP3 audio) of training by the Real Life Ministries Team. Rounding out the conference presenters were Jim Firth, Senior Pastor at Hope Community Church and Worship Leader of the returning Commissioned Worship Band. We enjoyed the same dynamic Worship Team this year featuring: Lead Vocals & Guitar- Kenzie Mae, Vocals & Guitar (Kenzie Mae Music) – Jeff Foss (Worship Leader of The Journey Church, Camarillo), Electric Guitar – Gabe Hollis (Hope Community Church), Kerry Small – Keyboards, Percussion-Nick Ficklind, Guitar & Spanish Lead Vocals, Misael Garcia and Bass Guitar & Vocals- Jim Firth. Additional inspiration was delivered by Misael Garcia featuring Hispanic Worship in Spanish. Thank you to our coffee & dessert sponsor: World Partners celebrated their 125th Anniversary with a cake as the Missions Arm of the Missionary Church. Executive Director Dave Mann gave a presentation as well as showed a Video celebrating the 125 years. Bethel College donated the Kindle Fire giveaway. President Greg Chenoweth shared highlights of the College including the fact that Bethel is ranked in the top 16 percent of all baccalaureate Colleges nationally by U.S. News and World report. Toby Lazo, Hispanic Ministries Director led a special session for our Hispanic churches and pastors. Pastor Toby challenged all leaders to concentrate their efforts in the development of spiritual transformation through discipleship. Transformed people, transform lives. Within this Hispanic group there was a fervent desire to expand their knowledge on how to make good Disciples of Christ. He also challenged the leaders not to abandon their dreams as all things are possible with Christ. During the Thursday morning general session, Toby reminded leaders that our nation is changing and that those in the Hispanic community could make a difference in a nation that is moving away from God. In closing Pastor Toby encouraged all Pastors to open their doors so that Hispanic ministries could emerge from among their congregations. Spanish Translation: Once again the conference was translated simultaneously into Spanish for our Hispanic Pastors and Churches. Thank you to Laura Hernandez Munoz (from Centro Libre Cristiano, Coachella CA) who donated her time and passion to our Spanish speaking attendees. CFW Legacy Breakfast: Almost 100 participants attended Christian Foundation of the West’s Breakfast to hear Board Chairman Randall Sanada and President Kathy Saigeon share the challenge for Churches to thrive now and for the next generation. Each church has the opportunity to create its Legacy in serving families and their children and grandchildren. Legacy gifts will increase when your church “makes room” for a Legacy Vision to blossom. CFW shared several ideas to help churches get started. Attendees also heard testimony from 2015 CFW Grant award recipients John Williams of Riverview Church, Surprise AZ and Guillermo Garcia of Operation Embrace Outreach Ministry, Oxnard, CA. These 2 were over a dozen grants awarded by CFW at its first Grants Awards & Banquet event in January. Then Kathy announced a leadership development conference September 23, 2015 focused on Donor Development, Board Development, and Grant Writing. This will be followed by CFW’s 2nd Annual Grants and Awards Banquet, January 28, 2016. Visit at www.CFWest.com to register for both. Church Multiplication Director, Dave DeVries reported on the most recent church plants and disciplemaking networks being started in our region. Currently 50% of churches in our Region speak English, 1/3 Spanish and 10% Korean. Our focus is on the multiplication of disciples, churches and networks throughout the region. Dave challenged all our pastors to identify their disciplemaking engine – a simple, intentional, reproducible process that actually makes disciples who make disciples – and he invited them to attend On-Mission training events in November at Olive Grove Church Nov 13-14 and LOCC Nov 20-21. Our newest church plant in Loveland, Redemption Church, presented a video that captured their vision, followed by a special time of prayer for Matt and Cheryl Brown, who are leading this team sent from Mountain View Church in Fort Collins in partnership with the Crossway Network. As we look to the future, we seek to equip our churches to be part of a multi-church network that is making disciples, raising leaders, and starting churches all over our region and beyond. Prayer Warrior, Pastor Ben Jennings blessed our conference during the Morning Prayer Chapel as well as several times throughout each of the sessions. Many expressed thanks for his deep spiritual insights at 91 years young. Poolside Banquet & Fiesta…Señor Fun (aka Dave DeVries) led our fun and colorful poolside fiesta with authentic mariachi music, dancing, eating, fellowship and entertaining games. The kids enjoyed the piñata while everyone attempted to dance the Macarena. Tortillas were flying through the air, hot chili peppers were consumed in mass quantities, and the Mariachi Band stole the show during dinner. Congratulations to all of our winners! Let’s Fiesta Video…thank you to Jim Firth for creating a festive video featuring all of our photogenic photo booth participants! Congratulations to Guillermo Garcia of Harbor Community Church, Ventura CA —Grand Prize Winner of a new IPAD, Rachel Prichard of Olive Grove Church, Nuevo CA — Winner of a Kindle Fire and Dan Flores (Prize Giveaway MC), Olive Grove Church, Nuevo CA — Winner of a Weekend Getaway in a guest suite at the Indian Wells Resort Hotel! Special thanks…We would also like to compliment and give recognition for the exceptional talents and many man-hours of our Tech Team: Jim Firth (Tech Director), Jeff Foss (Audio/Visual Specialist) Gabe Hollis (Videographer), Ellie Milne (Tech Support) and Canaan Yee (Tech Support). Kudos to the entire SPT/Regional Conference Team who are already planning next year’s conference, May 24-26, 2016!